Animal Aid Unlimited, a rescue organization in India, received word that strange moaning noises were coming from a sewage tank. They immediately went to check it out and at first couldn't see much ... and then made a heartbreaking discovery. 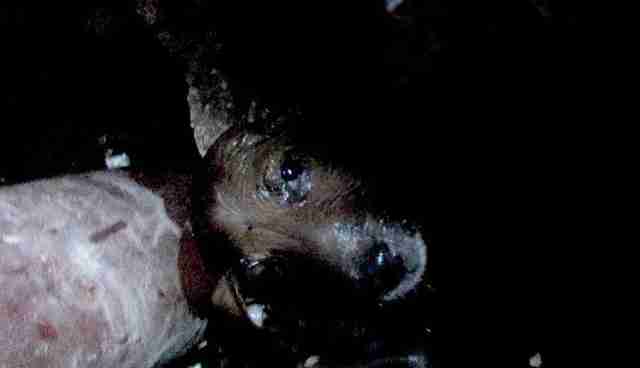 A little puppy was stuck inside the sewage tank, and he was drowning. The little guy could barely keep his head above the water, and was doing everything he could to cry for help. If he had been left in there for much longer, it's very likely that he would have drowned. ... with the puppy safely in his arms. ... but after only a few days he started to recover. He was also very afraid of people, but with a few treats and a lot of love, he slowly began to recover emotionally as well. Thanks to the puppy's cries for help and the rescuers' determination, he's now safe and dry, and free to lead a long and happy life.